Elhiem Modern War Figures from 1990 to the Present and includes Afghan, British, Chinese, insurgents, Iraqi, ISAF/Modern West, Russian, Somalia, Special Forces, Syrian, and modern US. 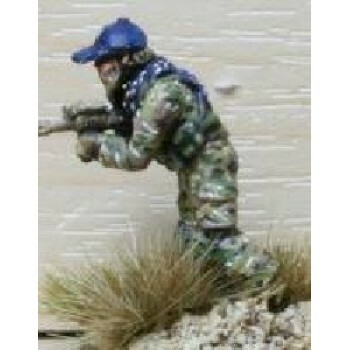 Also available in the Modern Ranges are objective markers/pilots, civilians,/crews and modern equipment. Some of the Elhiem Modern figure sets may require the purchase of a separate gun from their Weapon Sets. 20mm Modern Elhiem x2 .50 cal Sniper Team in Ghili Suits. Can be used for almost any army. Comes wit..
20mm Modern Elhiem x10 Mix of USMC in MTV body armour..
20mm Modern Elhiem x10 Mix set of British Army 2010+ in MkIV Armor and Helmet..
20mm Modern Elhiem x10 Random Mix Set of Modern Russians. Can be painted in just about any camo you ..
20mm Modern Elhiem x4 Delta Force Fire Team armed with M727 Carbines with optic and torch, 1 with M7..
20mm Modern Elhiem x2 Delta Force Snipers on x2 Bench Seats suitable for Little Bird helicopter conv..
20mm Modern Elhiem x4 Delta Force Snipers w/ M21 and suppressed M723 and two DF with M723 with torch..
20mm Modern Elhiem x4 Ranger Fireteam 1 Skirmishers in combat poses. Fireteam consists of 2x M16A2, ..
20mm Modern Elhiem x4 Ranger Heavy Fireteam include 2x M16, 1x M16M230 and 1x M60..
20mm Modern Elhiem x4 Ranger Vehicle Gunners for placing in models. Same figure repeated..
20mm Modern Elhiem x3 2010+ Special Forces in Fast helmets armed with GPMG and SAWs in helmets. Suit..
20mm Modern Elhiem x3 2010+ Special Forces in Fast helmets armed with M4 type carbines2010+ Special ..
20mm Modern Elhiem x3 2010+ Special Forces in Fast helmets armed with M4s kneeling in helmets. Suita..
20mm Modern Elhiem x3 2010+ Special Forces with MP7 style SMGs in helmets. Suitable for US, UK, EU a..
20mm Modern Elheim x4 Afghan dickers, triggermen, IED bombers etc. Unarmed except for phones and bag..
20mm Modern Elhiem x1 Afghan Taliban Suicide Bomber in Afghan clothing. Based on INS-07..
20mm Modern Elhiem x3 Afghan Insurgents/ Mujahideen with 1x Mosin Nagant sniper rifle, x1 Mosin rifl..
20mm Modern Elhiem x4 Taliban armed with a mix of LMG's including 1x RPD, 2x RPK and 1x PKM..
20mm Modern Elhiem x3 Afghan Insurgents/ Mujahideen with 1x PPSH41 smg, 1xDT LMG, and 1x SKS Auto ri..
20mm Modern Elhiem x4 Afghan Insurgents with PKM LMGs..
20mm Modern Elhiem x4 Taliban Specialist armed with specialist weapons. 2x AK+UGL, 1x G3 and 1x SVD ..
20mm Modern Elhiem x2 Taliban Technical Gunners with 1x PK (pictured) and 1x DHSK mounted on poles s..
20mm Modern Elhiem x3 Afghan Irregular DHSK heavy MG and Crew. Note 2 of the crew are figures used i..
20mm Modern Elhiem x2 Afghan Male casualties..
20mm Modern Civilians Elhiem x4 Afghan Male Civilians standing around in traditional Afghan clothing..
20mm Modern Civilians Elhiem x1 Camerman and x1 Interviewer in Afghan clothing..
20mm Modern Elhiem x3 African Civilian Set A includes 1x Figure of a civilian male carrying a bundle..
20mm Modern Elhiem x3 African Civilian Set B includes African Females in Civilian clothing with pots..
20mm Modern Elhiem x3 African Militia HQ includes 1x PPSh41, 1x PPS43 and 1x DP LMG in a mix of mili..
20mm Modern Elhiem x5 African Militia Vintage Rifles a mix of SKS, Enfield and Mosin Nagant rifles. ..
20mm Modern Elhiem x5 African Militia with Ppsh41 SMGs (1 with land mine). Conversion of our figures..
20mm Modern Elhiem x4 African Militia includes 1x scout with AK47 and one sniper in a mix of fatigue..
20mm Modern Elhiem x4 ALICE packs laden up with extra gear..
20mm Modern Elhiem x1 civilian archer with a bow..
20mm Modern Elheim x3 AQ Shadow Army armed with the much prized AK74 wearing balaclavas and AQ head ..
20mm Modern Elhiem x3 AQ Shadow Army armed with AK74 UGL, PKM LMG and RPK wearing balaclavas and AQ ..